Homespun Stitchworks..... For the love of vintage: Darning an art form with a needle! a certain pride in revealing itself ! As you can hopefully see from the photo it is the most beautiful piece of vintage quilt and I can only in my imagination think what the whole thing looked like .. such gorgeous pattern and colour. Then you can see, I hope, from my photo the little bits of white darning work that is a picture in itself and adds to this little piece of the quilt that survived. I do wonder at who stitched it as I hold this little piece of history in my hand. Having some worn vintage linen that was a sheet originally and then we used it as a table cloth but it wore through in places it was washed and pressed and is no in my linen store. I think cut a piece out with the wear and use some gorgeous hand dyed threads and make darning patterns in it. This could sit on my sewing room wall as I could always have room on the wall for pretty inspiration to look at. Watching a video on darning and the slow rhythmic motion of the weaving that is involved almost made me go to sleep I can tell you and this is why I love the slow stitching of today and doing hand embroidery. It was becoming a dying art but not any more it has made a huge come back and I am thrilled to say lots of teenagers are wanting to sew at colleges now as well. 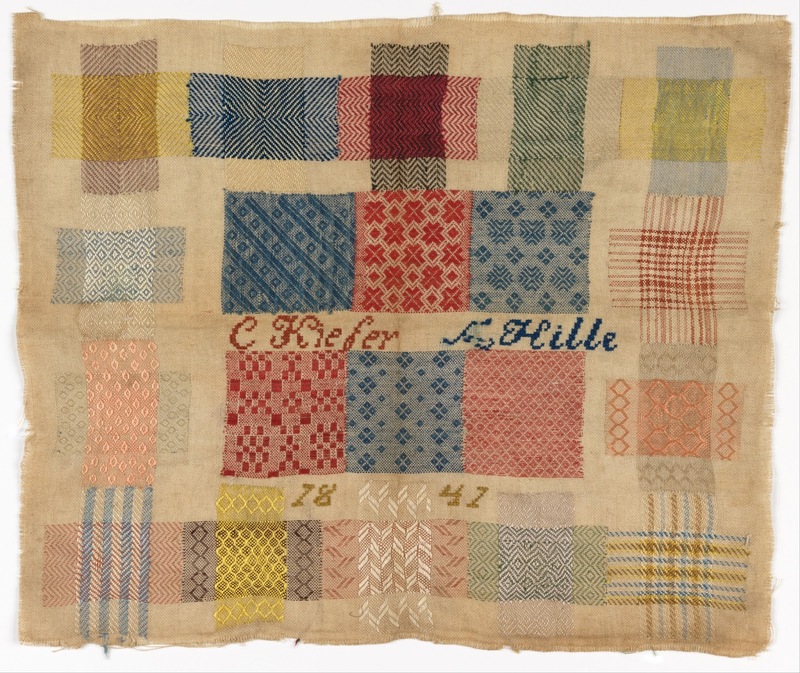 I found this image of a darning sampler on google and it is dated 1847 it is stunning and with the colours as well I think it is really is a piece of art. Now the lady who stitched it would probably be shaking her head in disbelief that her darning skills were now that treasured, however I am sure she would be thrilled too. 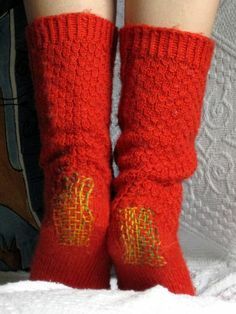 Socks is another thing I think can be enhanced by a bit of clever darning and I am currently doing that to pair of my socks that actually do not need it but will be all the better for it in my humble opinion. I saw this picture and it had to be done, what do you think. what I am using on my navy socks that I am hand darning just for fun with. Do any of you darn? 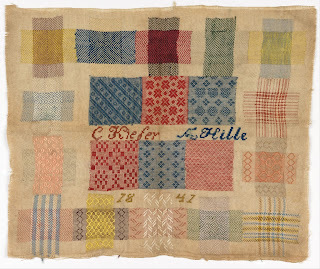 for fun I mean rather than make do and mend darning ... Do you have any collections of old school sampler books? I would love to hear about it as I am sure others that read this blog would as well. You can leave a comment on here and tell us all about it if you would care to share. I am not sure if you can add a photo on here at all but if you clever people out there know how I would be delighted to see as well. The rain cometh here for the last few days and although the gardens were in need it is time for our summer to return me thinks I am really missing sitting in the garden stitching. Monday and Tuesday were hot and sunny and I do sit out there in the rain under the huge umbrella as you know but it really has been blowing as well and droplets shook off the umbrella and onto my back, that was my time to retreat with my stitchery as water marks on my nearly completed piece would have sent me nearly over an edge I think so I am waiting for our Summer to return ..... Miss Muddy Beak is some what perplexed too she loves the rain for a while then she likes to grub about and she is not fond of water on her feathers it seems! I love darning! There I said something really strange! I actually have a vintage darning tool that belonged to my grandmother. Wish I could put a picture here to show you....... I was taught to use it by my mum and it is fun to use! I created lots patterns when I was a child, but very recently used it for its proper use! How fabulous! Are you unable to put a picture on here? Maybe I can for you and for other readers to see? I can add to my blog. How lovely to have a piece of family stitching history! Sorry pictures will not load on here it's something I need to look in to it! Darning now is more patterned rather than in seen which is fabulous..
Will look on FB for your photo Dawn. Lovely to hear from you. Yes darning holes is a Winter project I think too although darning on pieces of vintage linen in patterns is a great any time creative pass time. Take care and hope to see you next month.